Anterior compartment syndrome in common terms refer to the pain suffered by runners, especially, distance runners (which is why it is often designated as part of 'the distance runners’ epidemic') in the front of the lower leg. To further categorize it, this syndrome belongs to one of the four categories of shin splints, the other three being, medial tibial stress syndrome, stress factures, and tibial periostitis. This syndrome is further divided into two categories. acute stage which is considered a medical emergency and requires immediate medical attention. This problem will occur with little to no exertion. chronic stage generally occurs during exertion but will quickly subside once the activity has ended. It is also known as exertional compartment syndrome. The muscles forming in the lower legs are enclosed in a 'compartment' known as fascia. This covering has a consistency typical of saran wrap. During exercises, these muscles exhibit a tendency to enlarge as do muscles being exercised, along with increased blood flow which also causes muscle to swell. The function of the compartment is to resist this swelling and while performing this function, the pressure builds up within the the compartment. This in turn tends to restrict the flow of blood to the muscles and this results in a constriction that presents itself in the form of pain. The pain is localized on the front of the lower leg, on the outer side of the shin bone. The muscle involved here is the tibialis anterior muscle whose function is to help lift the foot upward. Anterior compartment syndrome may be caused when there is an excessive tightness on the calf muscles which then forces the anterior leg muscles to work harder to compensate. The resultant stress to the tibialis anterior muscle increases the probabilities of causing anterior compartment syndrome which can take place in two phases during the running regime. Immediately after the 'toe off', the foot flexes upward via the tibialis anterior muscle and the other 'extensor muscles' to clear the ground during the process of lifting the knee. This is responsible for the first phase of injury. The second phase is either during or immediately after the foot contacts the ground known as heel strike. At this stage, the anterior muscles work to slow down and stop the downward motion of the foot as it comes down to the ground. This is when the second phase of the injury tends to occur. landing heavily on your heels Runners who participate in competitive events, and who land heavily on their heels are more vulnerable to suffer from anterior compartment syndrome for the reason the anterior muscles have to work harder to stop the downward 'slapping' motion of the front of the foot to the ground. Stress fractures of the lower leg may mimic compartment syndrome, and normally show themselves up as small cracks (medically known as micro fractures). This condition is essentially due to repetitive low grade impacts of running, or in those who participate in aerobic sports. Medically two theories exist, overload and fatigue theories are cited as the causes for the stress fractures leading to pain in the lower leg. The overload theory traces the syndrome to the resultant muscle contraction when those muscles involved pull and put the stress on the areas connecting to the bone. The stress can cause the bone to bend each time which however takes places in a gradual manner. The repetitive actions of bending and straightening is said to the cause the cracks to appear. The fatigue theory, it is explained that as muscle fatigue occurs, the muscles lose their efficiency in function and diminish their supporting function of the bones and this decreased support to the bones are suspected in leading to stress fractures in the tibia. When there is a pain which is localized to a small portion of the bone, it is normally due to the occurrence of a stress fracture. Nonetheless, an X-Ray, bone scan, or mri is necessary to confirm this diagnosis. Compartment syndrome is usually diagnosed by measuring the pressure within the compartment, both at rest and during exercise. 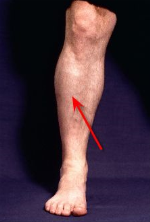 It is also worth pointing out that in addition to occurring on the anterior portion of the lower leg, compartment syndrome may also occur on the back of the leg as well as the outside of the leg. Both of these conditions occur less frequently. orthotics can be very helpful in the chronic syndrome on two fronts. A cushioned orthotic may help the excessive force caused during heel strike and secondly, an orthotic may better balance the foot so that the lower leg muscles are not forced to over work. Treatment for acute compartment syndrome is a totally different scenario. The signs and symptoms of acute compartment syndrome are known as the 5 P's. Pain- pain in the lower leg and foot. This is usually the first sign in compartment syndrome. Pallor- the affected foot turns pale due to the circulation being cut off. Pulselessness- excessive pressure in lower leg cuts off the circulation to the foot. Paresthesia- numbness or tingling in the foot and leg due to pressure on the nerves leading into the foot. Paralysis- inability to walk due to the excessive pressure in the anterior compartment. As stated previously, this is considered a medical emergency and immediate medical care is required. In the majority of these cases the fascia covering the compartment has to be incised in order to relieve the pressure. Failure to do so may result in tissue death to the foot due to lack of blood flow and nerve sensation.